Japanese beetle parasitized by a Tachinid fly. Gardeners should prepare themselves for the yearly summer onslaught of Japanese beetles on their flowers, lawns, vegetables and fruit. 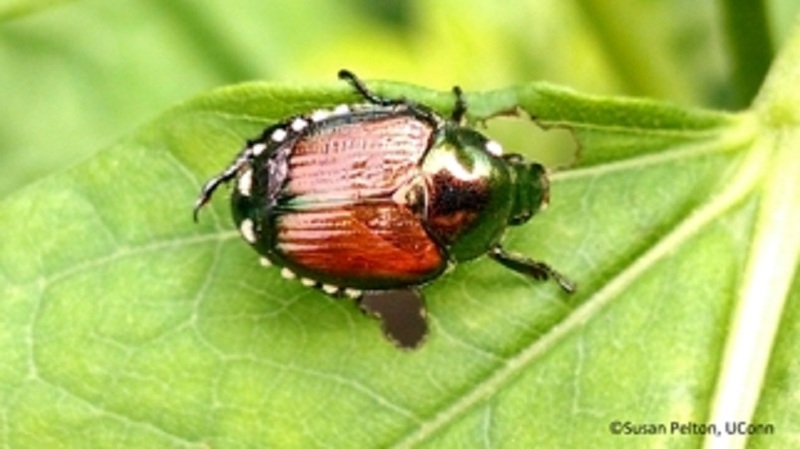 The Japanese beetle arrives just about the Fourth of July every year and many people report extremely heavy infestations. This notorious insect will feed on over 300 different ornamental and agricultural crops. They feed on leaves, flowers and fruit. The Japanese beetle (Popollia japonica) was first seen in the United States in 1916 at a nursery in New Jersey. It most likely came here on plants from its native Japan. Since then it has spread across the eastern United States into almost every state east of the Mississippi River. Although it does occur west of the river, the incidences are isolated. For this reason, there is a quarantine of plant material and other containers shipped west to prevent its spread by humans. Description: Adult beetles are metallic brown on their wing covers and green on the thorax. They are approximately 3/8-inch long. They raise two legs up to ward off predators with their sharp spined feet when approached. Damage can be to leaves, flower petals or fruit. Beetles will gather on the same plant or leaf to feed and mate. Japanese beetle adults start to emerge from the ground the first week of July and remain for about two to three months. Emergence of adults can be spread out for several weeks, so in the garden populations will continue to increase until the end of July. They will immediately start to feed and mate. The first adults to arrive emit a pheromone odor that attracts others onto the same plant. Once mated, females drop to the ground, usually in turf around the garden, and burrow about three inches into the soil. She lays 1 to 5 eggs at a time. After a day or so the female will return to the garden to feed and mate again. This process is repeated until the female lays 40 to 60 eggs. Once eggs hatch the grubs start feeding on grass roots and will do so until the ground turns cold in the fall. The grubs then dig deeply into the soil to spend the winter. The grubs return to continue feeding on grass roots when the ground warms in spring. This feeding is rarely as damaging as the fall feeding though. Grubs pupate into adults in June, completing only one lifecycle per year. Control of the Japanese beetle can be difficult because of their ability to easily fly from yard to yard in your neighborhood. If you control the population in your yard but no one else in the neighborhood does, you will still have beetles next year. When populations are high, it is recommended that you talk to your neighbors and develop an area-wide integrated pest management (IPM) plan. People should realize that this pest will not be eradicated. Minimizing damage is the best that can be expected. The first step in choosing control options is determining the extent of the problem. Observation, or monitoring, is always the starting point of a good IPM plan. You can do this by looking for beetles on your plants, look to see the extent of the damage caused or by trapping them in a pheromone lure trap. Surveying damage is important because different people will have different levels of damage they are willing to endure. The pheromone lure or bag-a-bug traps can be used to eliminate the pest or just measure the insect pressure. They should be used with the understanding that they will lure beetles into your garden from around the neighborhood. Make sure you place the trap far away from the garden plants you are trying to protect or you may end up with more damage than if you did nothing. If the bag fills quickly you have a real problem and other control methods may be necessary to protect your plants. If the bag fills slowly you don’t need to do anything else. When the Japanese beetles start feeding on your garden, just walk around with a jar of soapy water and hand pick them off plants and into the jar. They usually do not fly away when you approach them on a plant, especially when they are mating. Hold the jar under the leaf as you approach it because occasionally they roll off the leaf and drop to the ground when you try to grab them. There are several insecticides labeled for beetle control but they should be used only as a last resort. Spraying garden plants, especially flowers, has unintended consequences such as killing beneficial insects like lady beetles and parasitic wasps. Many insects, like honeybees, feed on flowers and when those flowers are sprayed the bees are exposed to the pesticide and killed. Pesticide use is not recommended for grub control in your lawn in order to control adult populations. Adult beetles will find your garden from off your property anyway. Lawn applied insecticides are effective at killing grubs but should only be used if the lawn is being injured. There is an easy way to tell if grubs are a problem. In September dig a one-foot square about three inches down and peel back the root zone of your lawn for inspection. Sift through the soil and roots for grubs. When there are seven or more grubs in this area control is usually necessary. Do this in a few areas around the yard to be sure of the population. When using insecticides for grub control, application time varies between materials so read instructions carefully. Another way to go about controlling Japanese beetles is with beneficial organisms. There are several effective biological controls for grubs including infecting bacteria (Milky Spore) and parasitic nematodes. In New England, due to cooler soil temperatures, milky spore disease has not been very successful in controlling grubs. Reports on the effectiveness of nematodes have been mixed. If choosing parasitic nematodes for control, it is important to purchase the nematodes fresh. Often nematodes will be shipped directly to the consumer. Upon receiving nematodes, it is necessary to apply them right away. Nematodes must be kept moist. A good time to apply them would be in a light rain or a cloudy day followed with irrigation. These materials may have to be reapplied to allow the beneficial populations to grow but after a few years they should maintain themselves. Most people that use these products report varying results so application instructions must be followed carefully. Tiphia vernalis Rohwer (Hymenoptera Tiphiidae), a wasp also known as the spring Tiphia, is a small parasitic wasp that attacks the older larvae or grubs of the Japanese beetle. Visit the CT IPM Spring Tiphia page for more information. Tachinid flies will glue their eggs to the outside of a Japanese beetle and then the newly hatched larvae will burrow into the host’s body to feed. If you see a parasitized Japanese beetle, leave it be. The beetle is already on the path to death and the developing fly can go on to parasitize another beetle.